Tributes have been paid to a former council leader who has died after a short illness. Professor Mike Preston passed away on Thursday, when he lost his battle with cancer. The 67-year-old, from Ratcliffe-on-the-Wreake, was a long-serving and respected Conservative politician. He led Charnwood Borough Council until earlier this year and had served on Leicestershire County Council since 1993, representing the Syston Ridgeway division while holding key positions as a cabinet member and as deputy leader. He had been diagnosed with cancer and stepped down as borough council leader because of ill health in May. Councillor David Slater, who succeeded him, said: "It is greatly saddening to hear of Mike's passing and our thoughts are immediately with his wife, Beryl, at this time. "Not only was Mike a cabinet colleague, he was my friend. "He was a jovial, friendly man who was always eager to talk to people to discuss their concerns and issues. This unique combination of skills made him an effective councillor and a valuable colleague. "He worked tirelessly for the borough to make it a better place for everyone and for that we are immensely grateful. "One of things that sticks in my mind is how Mike always handled himself with great dignity and had a unique talent for diffusing difficult situations with his humour." Other colleagues, including borough councillor Peter Osborne, also paid tribute. Councillor Osborne said: "Mike's approach was always to deal with people with kindness and he was always open to suggestions. That is the hallmark of being a good leader. "He wasn't an ambitious politician in the sense of wanting to climb the greasy pole but when he was asked to become council leader, he took on the mantle and did a great deal in a short period to see the borough through a difficult time." Prof Preston lived his entire life in Ratcliffe and was a lecturer in mechanical engineering at Loughborough University before entering politics. He and his wife Beryl had been married for nearly 38 years. He was the Conservative councillor for Queniborough between May 1999 and May 2011 and was borough council leader from May 2009 to May 2011. Charnwood Borough Council chief executive Geoff Parker said: "News of Mike's passing is deeply upsetting to staff who worked with him here at the council. Mike was a committed community servant." Leicestershire County Council's flag was flown at half mast as a tribute. 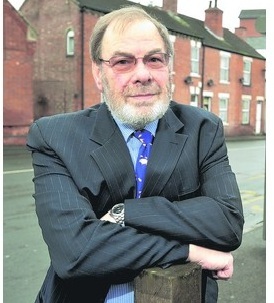 County council leader David Parsons added: "Mike's death is a huge loss and our immediate thoughts are with his wife. "A dedicated and passionate campaigner for local issues, Mike was a gregarious and affable person, and as such was well-liked and highly regarded by councillors of all parties and also the officers of the authority. Despite a quiet, unassuming manner, he fought consistently and steadfastly for residents in his division. Mike's contribution to local politics over the last 18 years is immense. He was a good man who will be greatly missed." THE former leader of Charnwood Borough Council who has been described by his peers as “a peacemaker” with “the powerful ability to get on with people at all levels” has died after a short battle with cancer. Mike Preston, 67, of Broome Lane, Ratcliffe-on-the-Wreake, who had lived in the same house all his life, served on the borough council for 11 years, transforming the local authority over the short time he was leader. Stuck with a limited budget and Government cuts, Mr Preston managed to secure a waste, benefit and revenue contract that aims to save the council £4.2m. He also fought for the delivery of the Eastern Gateway Project – even declaring to cough up the missing £1m if the Government did not honour its promise and provide funding. He also wanted to save the old court house, in Woodgate, from developers and set about transforming it into a council chamber and home to such organisations as the Citizens Advice Bureau and Glebe House. As well as serving as leader of the council between May 2009 to May 2011, he also served the people of Queniborough for 11 years and served as a county councillor for 18 years. At this year’s borough elections, he had no other option but to step down. Last year, he was diagnosed with cancer of the face, and underwent an 18-hour operation. However, this did not stop him from attending the elections, if only as a spectator, with his wife Beryl by his side. He started radiotherapy at Leicester Royal Infirmary but over time his condition worsened. Dozens of peers have paid their respects – with a book of condolence opened at the council’s Southfields office. Last Friday, the county council’s flag was flown at half-mast to honour his life and commitment to the council. Mr Preston was also an engineering professor at Loughborough University and a leading authority on Auster aircraft, having written a number of books. He leaves behind wife Beryl. The funeral will be held on Wednesday, August 31st, at 11.30am in Queniborough.